AGES ago, when I was at Food Blogger Connect, I came across Oatly. A dairy-free alternative to milk, Oatly is made from, as you might guess, oats. At FBC they had made delicious chilled coffee drinks with it and had used it in cinnamon rolls. 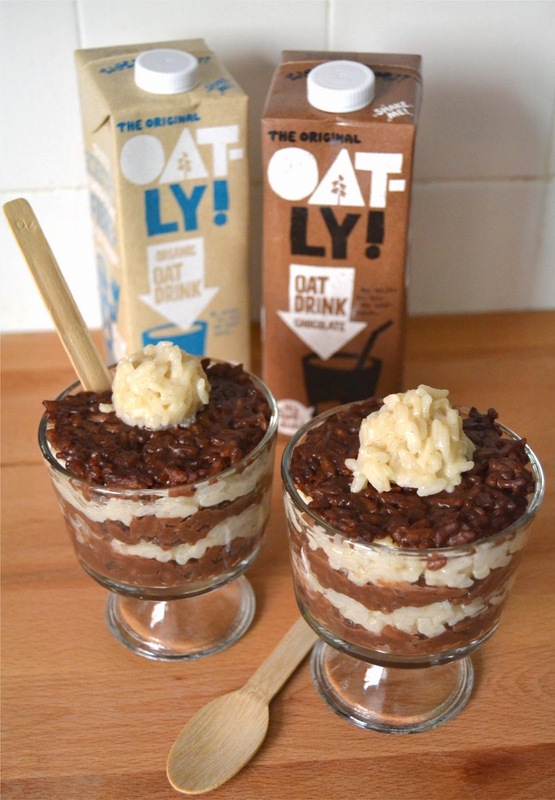 When I was sent some vouchers to give Oatly a go in the kitchen myself, I knew what I was going to make with it. Rice Pudding is a childhood favourite of mine and I wondered how well it would work dairy-free? To make this rice pudding, I actually used Arborio rice, normally used in risotto dishes. Because of it’s high starch content, I thought it would lend a creaminess without the cream also. And as Oatly comes in original and chocolate flavours, I decided to make two batches, one of each flavour. I layered the chocolate rice pudding with the original which I added vanilla to. The effect and taste was delicious. To start with, I toasted the Arborio rice in a little veg oil, then added the heated Oatly slowly to each pan, just as if you would if you were making risotto. After about 25 minutes, I had two pots of thick, creamy rice pudding. I added some raw cacao powder to the chocolate batch after cooking to bring out even more chocolate flavour and I also sweetened it was some stevia sweetener. And, I added vanilla bean paste to the original and more stevia. The flavours were tasty indeed. Rice pudding with no lactose! Take two large saucepans and add 1 tablespoon of veg oil in each. Add 150 grams of rice to each pan and stir to coat with the oil, over low heat. Heat both types of milk in the microwave until warm. Gradually add the milks to each pan, over medium low heat. Add a little at a time - just covering the rice - let the liquid absorb - then add more. This will take about 25 minutes for all the milk to be absorbed and the rice to be tender. Remove from the heat and add one teaspoon of vanilla to each pan. Stir through. Add the tablespoon of cacao powder to the pan of chocolate rice. Stir through and lastly sweeten each pan with stevia to taste. Layer in glasses, swirl or eat separately. Disclosure Statement: I was sent vouchers to try Oatly. I was not requested to make a recipe. Any opinions expressed are my own. That's one of my favorite desserts, I could eat it every day how much I like it! Takes me right back to childhood! The Oatly stuff is fantastic Kevin. Hopefully they will be at FBC next year and hopefully you will too! !